"Everyday I go to work I feel lucky to be doing something I am proud and passionate about. there's no other job I'd rather do." ​Abalone is a mollusc that is prized, particularly in Asia. Wild abalone lives in the cold, clean waters of Southern Australia and needs water movement and abundant seaweed on rocky reefs to thrive. The Victorian coast provides the perfect growing environment for these amazing shellfish. Victorian wild abalone is collected by hand. Experienced divers brave the cold and shark infested waters to harvest abalone from depths up to 30 metres. The wild abalone fishery is one of Victoria's most valuable professional fisheries. Almost all of the catch is exported to international markets, predominately Asia, but local interest in abalone is growing. Where are the Abalone fisheries? Western Zone starts at the Victoria/South Australia border and finishes at the mouth of the Hopkins River. Central Zone stretches from the mouth of the Hopkins to Lakes Entrance. Eastern Zone starts at Lakes Entrance and finished at the NSW/VIC border. Around 700 tonnes of wild abalone are caught annually in Victoria. Most of the catch is Blacklip abalone, with a small amount of Greenlip abalone caught (less than 1% of total catch). Abalone are hand-harvested. Abalone divers collect the shellfish using a flat, chisel-like bar which detaches the ‘foot’ of the mollusc from the rocks. Abalone divers use hookah gear to remain underwater for long periods of time. Diving for abalone is notorious, not only because of the dangerous conditions they are forced to work in – cold water, strong currents, risk of equipment failure – but also because divers share the ocean with sharks. In Victorian waters, Great White Sharks and Bronze Whaler sharks are common, especially in the areas abalone are found. The number of Abalone fishing licences are limited to 71 in total, with 14 in the Western Zone, 34 in the Central Zone and 23 in the Eastern Zone. Victorian abalone fisheries are managed using a total allowable commercial catch (TACC) for each Zone. The TACC is set annually based on the outcomes of a stock assessment process. Annual total allowable commercial catch limits are published by the VFA here. Then, for each Zone, an allowable catch is allocated to each reef area within the zone. This allows finer scale management. Individual quota holders are assigned a proportion of the TACC and quota is transferrable. Size limits also apply to both species of abalone. The stock assessment process is informed by: Fishery independent abundance surveys; Length frequency from commercial catch sampling and independent monitoring; Dive related information (e.g. 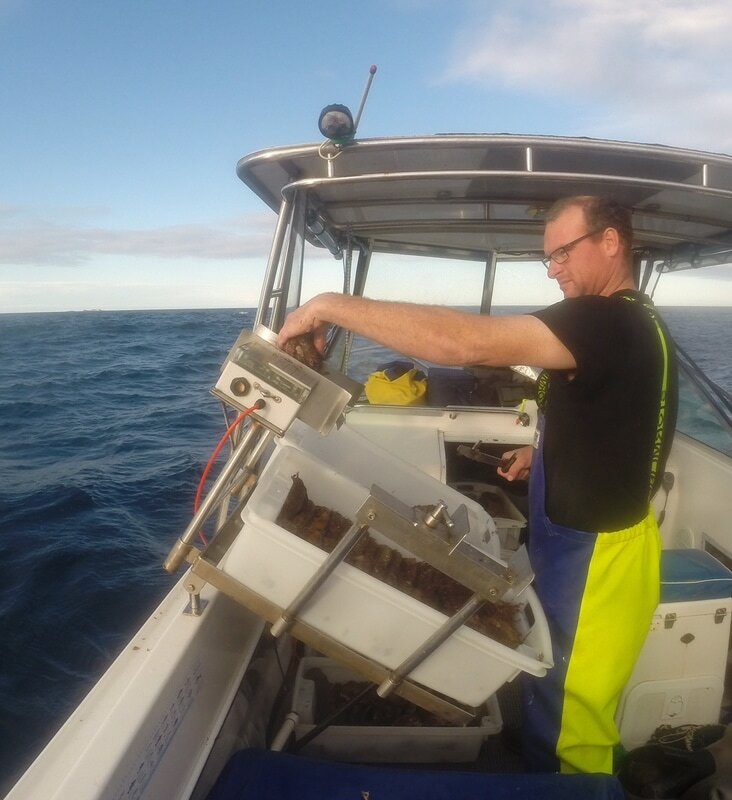 depth, temperature and location); Diver observations; Catch rates / catch per unit effort data; Catch history; Fishery modelling; and available research such as maturity, spawning potential, natural mortality, growth and biomass estimates. The Victorian wild abalone fishery is very well monitored and understood relative to other fisheries. There has been considerable investment in abalone research, including industry-led initiatives to assist the management of this valuable resource into the future. All three Victorian abalone zones have been adversely affected by disease and invasive species in recent years. The Western Zone and Central Zone were decimated by Abalone Viral Ganglioneuritis in 2006/07. In the Eastern Zone the stocks have been adversely affected by the invasion of sea urchins. In an industry-led FRDC project, both the Western Abalone Divers Association (WADA) and the Eastern Zone Abalone Industry Association (EZAIA) are relocating small abalone (70-100mm) from healthy reefs to affected areas in an effort to re-establish breeding populations of abalone. Data logging Abalone as they are caught.